When I saw this research, I had to re-read it to believe it... Nasal packing with good-old fashioned bacon stops nosebleeds!!! Yes... you heard me correctly... and it was actually published in a reputable ENT journal in Nov 2011. AND, it was conducted here in the USA (Detroit, Michigan). The current standard of care for nasal packing to treat nosebleeds is using synthetic hemostatic products that appear similar to tampons used for menstruation. Watch video of standard of care nasal packing for severe nosebleeds here. However, this publication in 2011 wasn't the first to document use of bacon for nosebleeds. There have been reports on use of bacon since 1940 sporadically (see references below). 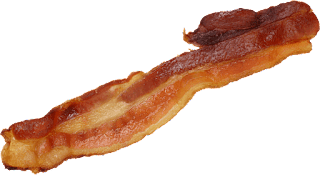 In this day and age of cost-cutting and finding cheaper alternatives, bacon is pretty much as cheap as one can go to address nosebleeds. Compare this to synthetic nasal packing which costs on upwards of $50 or more. Although bacon may work to stop nosebleeds, I personally have no plans to use bacon in this manner other than to eat. This research has even been portrayed (teased) on the Colbert Report. Read more about nosebleed management. Another unusual nosebleed management includes the application of female hormone estrogen (vaginal premarin cream) to the nasal mucosa. Traditional nosebleed treatment includes nasal emollient application, humidification, nasal cauterization, septoplasty, and eventually nasal packing. Nasal Packing With Strips of Cured Pork as Treatment for Uncontrollable Epistaxis in a Patient With Glanzmann Thrombasthenia. Ann Otol Rhinol Laryngol 2011;120:732-736. Rendu-Osler-Weber Disease— Is Embolization Beneficial? Arch Otolaryngol. 1976;102(6):385. GENERAL PRINCIPLES IN TREATMENT OF NASAL HEMORRHAGE. AMA Arch Otolaryngol. 1953;57(1):51-59. USE OF SALT PORK IN CASES OF HEMORRHAGE. Arch Otolaryngol. 1940;32(5):941-946. Yes, eat plenty of bacon, as the fats will clog your arteries, so the blood won't flow! Forty-five years ago I had my first severe nosebleed at home, and called an my ENT who had me come to his office, after attempting generally accepted procedures without success, he somehow created a pork rhine packing somehow secured from the back of my throat to the back of my nostrals that did the job. For a year or so I would get a salt pork taste when eating, it eventually faded away.